Under the shadow of His wing is the first release on the new VasariMedia label. Commissioned by Vasari Singers, the piece was conceived by composer Jonathan Rathbone as a contemporary reworking of the Vespers service. Movements for three choirs are skilfully intertwined with a female semi-chorus, full choir and octet. Contemporary settings of traditional texts are mixed with sublime arrangements of well-known hymns. The listener is taken on an atmospheric musical journey from darkness to light, in an enveloping acoustic experience. The work was premièred by Vasari Singers in October 2014 at St Alban’s Church Holborn to a rapturous reception. Vasari Singers, one of the UK’s finest chamber choirs, is now in its 36th year under conductor Jeremy Backhouse, and has a long history of commissioning major new works from a wide range of composers. VasariMedia is a new venture for the choir, which has never failed to disappoint through its discography of 25 CDs released on commercial labels. This 16-track double CD was recorded in the resonant chapel of Tonbridge School, Kent, in February 2015 under the expert guidance of producer Adrian Peacock. 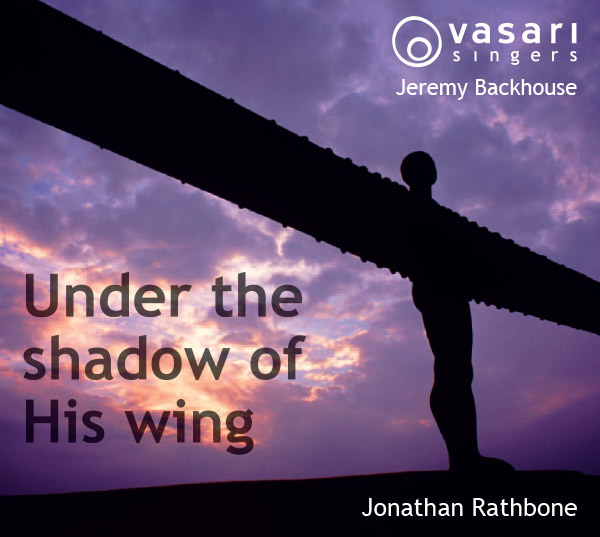 Under the shadow of His wing – Musicweb International - Rathbone’s music has been splendidly served here by Jeremy Backhouse and the Vasari Singers. Under the Shadow of His Wing – The Guardian - **** ...seductively lush harmonies in 16 attractive a cappella pieces.